She's absolutely wonderful. We're so thankful for a second "forever baby". After a difficult pregnancy and a very busy month trying to get our new house all in order before the baby arrived, it's so great to just be home with our baby, settling in and making plans that don't include lists of home repairs or closets to organize and that don't require my phone timer going off all day reminding me to eat the right things at the right times and then prick my finger an hour after! Our new normal has been much anticipated and I'm so filled with joy and so excited that we are finally here. As we've mentioned before, we're on pause from foster care right now as we settle in with our new house and new baby. We want to give Baby Gigi her time to be in the spotlight and Big Brother A time to adjust before we reallocate our time and energy into another little foster brother or sister. And we're still tracking with Baby S, too. Even though we're not doing foster care at the current moment, it has changed things. It changes the way I see our current journey. I can't go a day without feeling the enormity of how blessed we are. Before foster care, I thanked God that we had a home and that we weren't living on the streets. I thanked God that we were healthy and that our marriage was better than we deserved, by God's grace. But I've learned that our blessing goes so much beyond these things. I'm learning that I'm not a better person because of my good choices; rather, I'm a better person only by God's power working in me and if I had dealt with some of the situations birth families deal with, maybe I'd be surprised at how much I'd look like them. God is big enough to meet their needs and we are all responsible for our choices; difficult situations do not excuse sin. But my list of blessings that I thank God for has expanded. The list goes on, but I think you get it. Blessed beyond measure. And I cannot see my newest little baby except through this lens. Today, Baby Gigi is ten days old. I've been looking ahead and counting down to this milestone. It's been a bittersweet reminder to see this day approaching. Baby M was ten days old when he came to us. I've watched Baby Gigi grow and learn so much in the last ten days. She has learned that she can cry to communicate. She has learned that when she's hungry, mommy will feed her. She has learned my face; she will stop crying in my arms even before she's eating because she knows food is coming. She has learned that there are other people who come and go from our home; kind and gentle people who talk over her in sweet voices and stroke her soft hair. And she has learned that there are three constant, stable people who are always here with her. She's learning family. She's learning stability. She's soaking in love at every moment. We can't get enough of her. But my Baby M? He had lived in FOUR places by the time he came to us. He could cry to be fed in three of those. He was physically cared for in three and loved and nurtured in at least two. But there was no stability. There were no attachments forming. He was learning aloneness. He was learning constant change. The smells were always different; the sounds were never dependable; he didn't know who would answer his hunger cry, or what the formula would taste like, or what kind of bottle he'd have that time. And his mama? She was probably feeling a lot like I am right now, physically. Still sore and tired. Probably still dealing with a milk supply that wasn't going to be feeding her baby. A little hormonal and emotional, but without the happiness and peace and beauty of her baby to keep her going when she was tired and overwhelmed. Her nights were still sleepless, but she didn't have her baby there to feed. His baby things were set up and ready in her home, but he wasn't there. So while I soak up all the sweet moments and kiss my baby for the hundredth time today, I choose to feel blessing, not pride, at where we are and what life looks like in our home. While I snuggle my sweet forever baby, I pray for the mamas who choose adoption for their little ones, who fight through long hard pregnancies and difficult labors and make the very brave and loving choice to let someone else walk out of the hospital with a new baby in their arms. I pray for the mamas who thought this would be the baby they could finally keep, only to have their child immediately removed into foster care; mamas going home with an empty womb and an empty carseat. I pray for the mamas who did succeed in providing their children care for a time, only to have them taken away later. I thank God that he has a role for us in a few of these families, and I pray that he could use us not just to love on little ones, but to help moms and dads to feel love, stability, and acceptance - maybe for the first time. I want to say bringing home my biological baby is no different than bringing home a foster baby. It's simply not true. I love them just the same. But there's a kind of instant, fierce protective instinct over those little foster babies that is replaced by pure gratitude and awe in my forever baby. There's a part of me that rises up with a readiness to fight and an extra rush of adrenaline to answer every whimper before it's even escaped their lips when it's my job to teach an older baby the lessons of love and nurture and responsiveness that my newborn is learning now. I love them just the same. 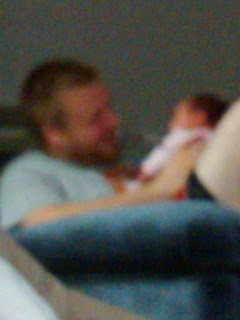 But there's something different about holding a child whose future is so uncertain. You have to do all your fighting for them right now, because you might not get a chance tomorrow. When I hold my forever baby, I hear all of the people who've held their forever babies and then asked me, "Isn't it hard to say goodbye to a foster baby?" My heart breaks a little because I cannot picture saying goodbye to my Baby Gigi. But then I remember the fight that rises up inside of you when you're loving on a possibly-temporary child; and because the bits of love you can give them might have to last them a very long time, you love them hard and you love them without reservation. Your heart can handle another break, because they need this and because you love them enough to break for them. I am so thankful for my forever babies. I look ahead eagerly to the day where we continue foster care. Eagerly, and with a lot of sadness and some nerves, too, because it's never easy, and you don't go a day of loving a foster child without remembering that their future is uncertain and wishing desperately you could fix things for them. I continue to pray for the babies who left, because God is big and good and he has not forgotten them. 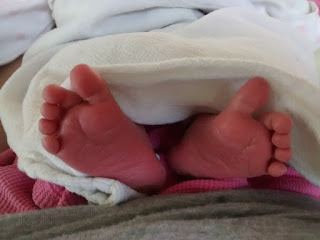 And I breathe in the smell of my baby's hair and stroke her tiny toes and find immense joy in storing up her clothes for the coming year knowing that she'll still be here to wear them. Beautifully penned,Heather! Congrats your your new baby and high five to big bro!